It may be of interest to future generals to realize that one makes plans to fit the circumstances, and does not try to create circumstances to fit plans. When I was a member of the Asia Pacific new products introduction (NPI) team for India at Hewlett Packard, we had themes that were developed by HQ (Palo Alto) for each region that would then be used in each country. That year’s theme was “HP Rocks the World”. Here is a bad photo of the 3D version of the logo we received as high quality TIFF files and sample marketing collateral designed and sent to us in the field. ‘In the field’ for a company the size of HP meant the various countries in the APAC region. From regional MarCom HQ in Singapore, I received implementation ideas through the listserv for country NPI coordinators, for example Malaysia had the speakers drive onto the stage on Harley Davidson’s wearing black leather jackets with the logo emblazoned in living colour across the back and other such dramatic concepts. I was horrified. I knew it wouldn’t work at all in India. Here, HP was perceived as a corporate MNC – a global brandname, a Fortune 100, a ’10 Most admired companies to work for’ (in 1996) with all that that entailed in the Indian corporate environment. Our audience of VARs, dealers and distributors just wouldn’t get it if I did something along the same vein, they’d think HP had lost it’s mind. It just wasn’t done. 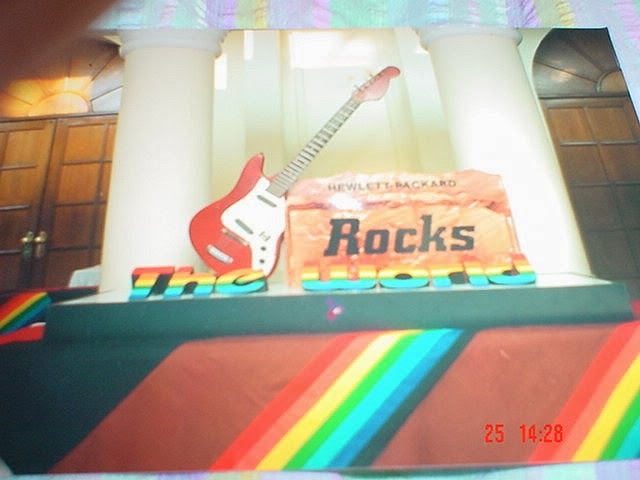 So my compromise solution (I would have preferred a more appropriate theme altogether) was the most sober implementation of the theme that I could conceive – to create a 3D representation of the logo, using a real electric guitar as the main focal point and echo the rainbow colours along specially made table cloths. I’ll write again on the design brief because that was an exercise in tight budgetary control, widely divergent venues and maximum flexibility in itself. Coming back to the point, I’d like to put forth the concept that when entering a new market, especially one in another culture, it makes more sense to empower the executors of your brand and messaging strategy to adapt to the nuances of the customer’s preferences than to enforce strictly the corporate identity guidelines traditionally used to protect the brand’s identity. And this where the concepts derived from the blogosphere – that markets are conversations become important – ask your cogs in the field about their specific markets, they talk to your customers, they know what would work there. Co-create with them your strategies, adapt and tweak them for each market, within the umbrella identity of your global brand. Maintain the flexibility to localize, be willing to let go absolute control to allow your audience to create their own brand experience. All of these things are not new ideas anymore, they’ve been brought up in so many ways in the news, in blogs, in conversations. If products can be designed to enable the users to create their own experience, can’t the message/brand identity be designed to evolve into each market’s experience?